Happiness depends a lot on which side of the brain we use. If you feel under pressure, your brain is telling you that you have been using your left brain to its maximum capacity. 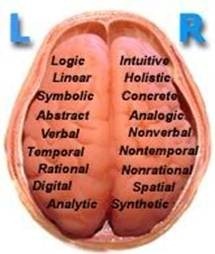 85% of the time, we function using our left brain. We make sense of things, think of sequences, analyze language and meaning, interpret information and communication and absorb new facts from all around us. Although these functions are necessary to our life, the left side of our brain has its limits and uses pressure to signal that we need to let go and switch to using our right brain. 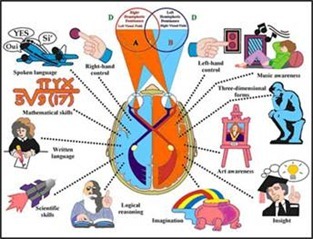 The left hemisphere of our brain functions like a sequential receiver and processor, while the right hemisphere is in charge of our imagination, sleep (dreams), memory, intuition and all of our creative functions. We absorb with the left side and create with our right side. 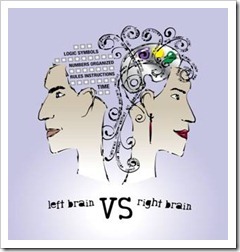 The brain is like battery – the right side charges it and the left side uses the energy and empties it. Our goal is always keep our mental battery charged. In our fast-moving world with way too much information, our brain reaches this point of pressure very often. This is when the brain pushes the “red alert” button and says “Enough! No more information. No more analyzing. No more thinking and no more talking!” If we ignore this signal, the sounds of the red alert and danger increase until we collapse or fall asleep from exhaustion. Have you noticed you get tired very quickly under pressure? Sleep is a very good way to turn the left hemisphere off, which is why meditation works so well to help us relax. When your mother says, as mine did, “Go to sleep. 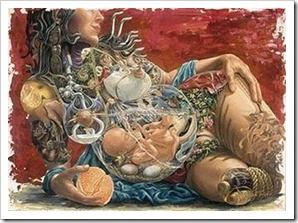 Things will be much better in the morning”, it is because she wants you to work with the brain, not against it. The risk of not paying attention to the warning signs are that sometimes, we overload the left brain so much that hours of sleep cannot heal it and many normal functions of the brain get out of control. Anxiety is such warning sign. We have increased heartbeat and cold sweat. When we are under pressure, the body releases Adrenaline and Cortisol, making it harder for us to fall asleep or relax. When facing a stressful situation, these hormones block our thinking and prevent us from finding even simple solutions. The best way to change the balance and turn off the warning signs is to use the right brain more. Fun things we enjoy and love doing can do this straight way. Laughing, dancing, listening to music, singing, doing art and playing with animals can make a huge shift in our level of pressure. If the things we do are easy and familiar, the shift is also very easy. The use of the right brain releases endorphins, making us feel good. Endorphins are “feel good” chemicals that trigger fun, enjoyment, happiness and relaxation. These chemicals also fight illness very well, help us boost our immune system and handle pain better. Happy people are healthier. 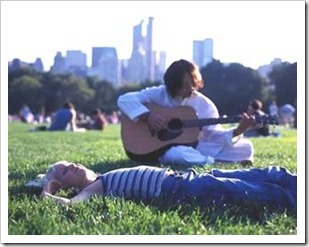 When I learned that, I discovered that the best way to heal a sore throat was singing. I would put music in the car and sing out loud. While in the past, I’d had to take antibiotics for two weeks, singing only took two days. Think about the left brain as an office serving customers constantly. Every officer needs breaks to go to the toilet, have a drink and go home for a rest at the end of the day before starting the next day refreshed. Our ability to sleep can tell us how well we balance the use of our. People who fall asleep easily, anywhere have mastered the shift from one hemisphere to another. Those who find it hard to sleep overuse their left brain and find it hard to stop thinking, analyzing and collecting information. The trick is to shift to the right brain straight away when you feel you are under pressure. If you hold on there for 2-5 minutes, the pressure will ease immediately. Look at this spinning woman on the left. If you see her dancing clockwise, then you use more of the right side of the brain. If you see here dancing anti-clockwise, you use more of your left brain. Most of us would see the dancer turning anti-clockwise, because we use our left brain mostly. It is possible to shift the focus and change the direction, so try that. 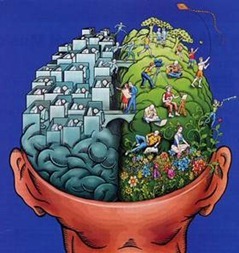 People are different and use one side of the brain more than the other. Yet, we all have to be able use the right side of our brain in order to be happy. Remember, the left side is draining and we have to be able to charge the batteries well. Cook or bake – just enjoy it! Make a mess and be creative, then eat! Gal and I saw the video below on TED a few years ago and were extremely impressed with the way the presenter explained the way the two sides of the brain work. I hope you will be inspired to use your right brain more often after watching this, much like we were. Although we have a natural tendency to use one side of our brain, it is important for us to be able to use the other one, mainly the right hemisphere. When we talk about stimulating the right brain to help us relax and think clearly, enjoying art, creating art and having fun are the keys to managing stress and allowing more happiness to enter our life. Be Happy! Everyone can do it using the right side of the brain, and practice makes perfect (oops, that was left-brain reasoning…). Sorry, but you are wrong and confusing people who read your article.